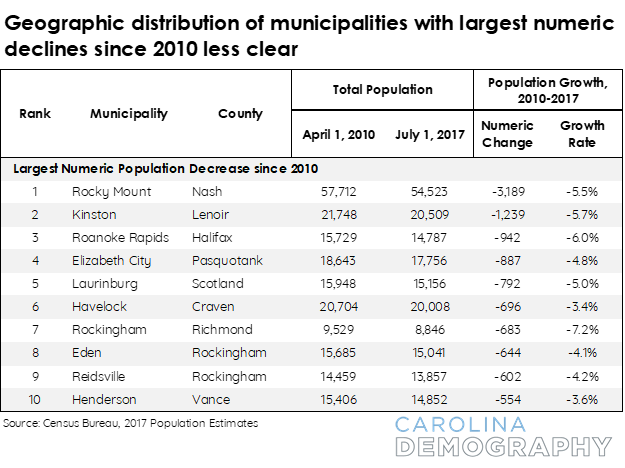 From 2010 to 2017, 247 North Carolina municipalities experienced population decline – approximately 45% of all cities, towns, and villages in the state. This represents an increase of 22 municipalities since last year’s population estimates were reported. After accounting for municipalities growing at a stagnant pace – below the state growth rate of 8% – this figure rises to 427 in total. This means that over three-fourths of all places are declining or growing slower than the state average. Growth is increasingly concentrated in a select few regions of the state and population decline is gradually becoming more prevalent. The 2017 Census population estimates largely follow the same patterns observed last year. Most importantly, North Carolina’s northeast corridor continues to experience the largest population declines. 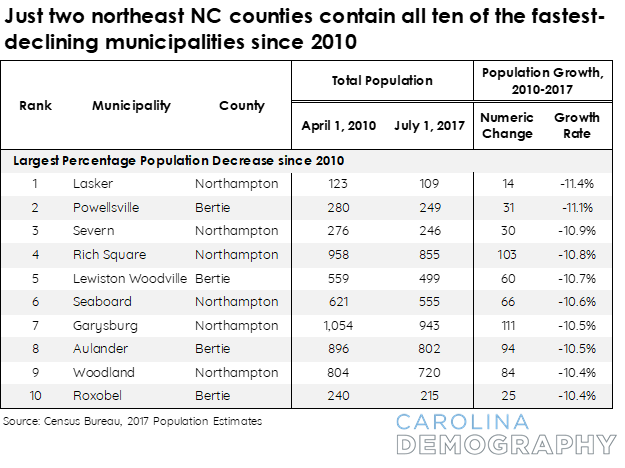 In fact, just two counties from the Northeast housed all ten of the municipalities with the largest percentage decreases since 2010: Bertie and Northampton. Every municipality on this list has lost a tenth or more of its population in the decade so far. Among the municipalities with the largest recorded numeric decreases from 2010 to 2017, nine out of ten were also found on this list in the previous year. There is not a clear geographic distribution to this list of municipalities, though several fall within counties located in either the northeast or the Sandhills region of the state. 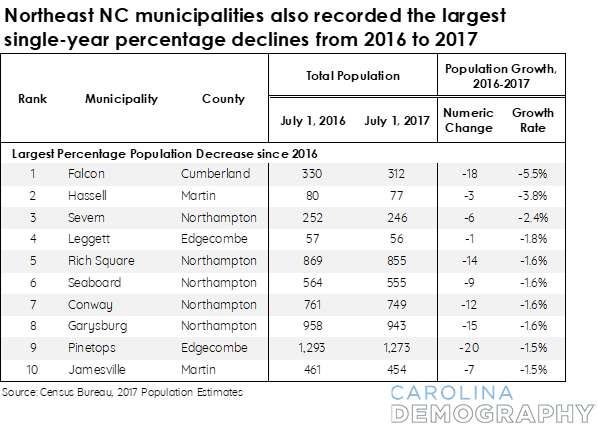 Municipalities with the largest single-year percentage declines from 2016 to 2017 were predominantly located in Martin, Northampton, and Edgecombe counties – all located in the Northeast. The long history of population decline in this area shows little sign of reversing. Finally, five of the municipalities with the largest single-year numeric declines (from 2016 to 2017) also had the largest recorded declines since 2010, indicating that these population trends are likely to continue. Interestingly, two municipalities from Davidson County – Thomasville and Lexington – recorded single-year losses not previously seen in last year’s estimates. 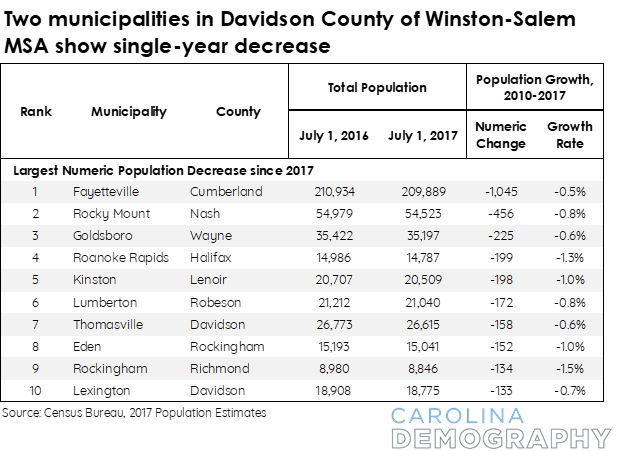 Davidson County was just added to the Winston-Salem Metropolitan Statistical Area in 2013, reflecting the “increasing urbanization of bedroom rural counties”, according to the director of data and information services for the Piedmont Triad Council of Governments, Anne Edwards. These two municipalities are of importance to Davidson County, as Lexington is the county seat and Thomasville its largest city. No predictions can be made yet on whether or not this trend will continue for Lexington and Thomasville, though it may support other patterns of growth witnessed in the 2017 population estimates. Contrary to the 2016 estimates, population growth was more concentrated in larger metropolitan cities (>40K), rather than the rural, exurban communities surrounding these cities. Winston-Salem and Greensboro, in particular, both appeared on the top-10 list of municipalities with the largest single year of growth from 2016 to 2017, though they did not rank in the previous year. This entry was posted in Carolina Demographics and tagged counties, municipalities, North Carolina, population decline, population estimates, U.S. Census Bureau. Bookmark the permalink.